With very fine foliage that turns a golden yellow to orange in autumn, Acer palmatum ‘Kinshi’ earns its common name of Gold Threads Maple. This is a dwarf maple, rarely reaching more than 3 metres in height, although slightly more in good conditions. Foliage is very deeply dissected, green when new and then turning to the very attractive golden yellow in autumn. Being a naturally small growing tree, Acer palmatum ‘Kinshi’ is another that is well suited to growing in containers. Growth rate is relatively fast over the first few years, it then tends to slow right down. The Japanese name ‘Kinshi’ translates loosely to ‘Golden Threads’. Having typical linearilobum type foliage (long and narrow), A. palmatum ‘Kinshi’ is best planted in a position where it receives good dappled afternoon shade and protection from hot drying winds. Best planted in a humus rich soil, well drained in a protected position. Prepare the soil before planting by digging in well rotted compost and a little aged cow manure. Water in well with a liquid seaweed fertiliser, and water well through the first few summers. A general purpose slow release type fertiliser in spring is beneficial. Spread – To around 3 metres. Position – Protected from hot afternoon sun and drying winds. Foliage – Mid green, very fine and turning to a golden yellow in autumn. 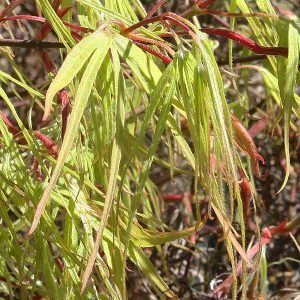 Acer palmatum ‘Kinshi’ is available for sale from the following participating nurseries.